Say cheese! Or shall I say, 'sayyy, swiper no swiping!' Make sure you buy the 2AA batteries to go with this gift because your little one will want to use it right away. It's a great beginner camera for kids. The camera is also said to have the capability to be used as a webcam and a video camera! 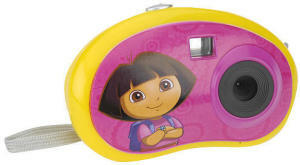 Your little girl will love taking pictures of her adventures with the Dora the Explorer Talking Digital Camera. This camera says three different encouraging phrases. The internal memory holds up to 120 images, and the included Dora SnapShots software lets her create albums, write a story, and play 5 games. Dimensions: 4"W x 1"D x 2.5"H. Weight: 5 oz. Warranty: 1-year manufacturer's warranty. Retails between $24.99 and $29.99. This is a great kid-friendly camera, and not to mention, affordable! Check out Toys R Us if you want to purchase immediately!